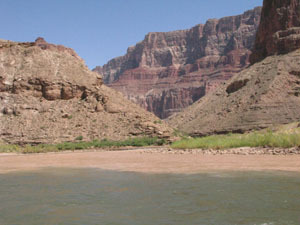 During a visit to the South Rim of the Grand Canyon many years ago, I looked down on a tiny ribbon of water flowing between the enormous rock walls and vowed to be on the river one day. 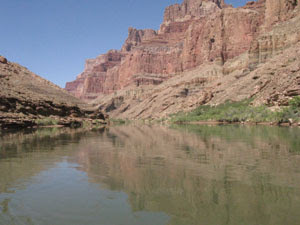 That dream actually happened when we took a 10- day rafting and hiking trip with Arizona Raft Adventures on the Colorado River in the Grand Canyon. What an exciting adventure it turned out to be! Gorgeous, ever-changing scenery, fascinating geological history, and challenging excursions made this one of my all-time favorite trips. Leaving Lee's Ferry and starting our raft adventure. 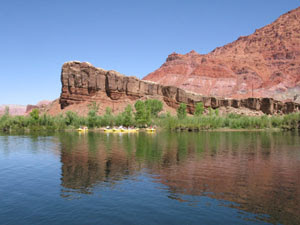 Our first day on the Colorado River, really a half day, we covered 18 miles past the put-in at Lee’s Ferry, Arizona. Day 2 was full of rapids--thrilling and wet--and put us 30 miles further downstream. 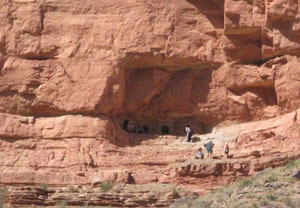 The next day included a challenging hike with a 700 foot incline to some Puebloan granaries. 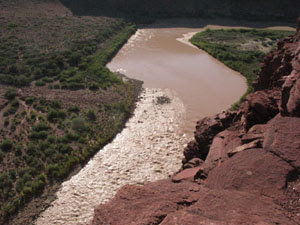 This was just past large, white-water Nankoweap Rapid at mile 53 and provided spectacular views of the river from the top. The hike took most of the morning, about two and a half hours, after which we piled back on the rafts and headed through several more rapids. We stopped for lunch above the junction with the Little Colorado River, never expecting the tremendous change we’d soon see in the water. Our guide Randy suggested we all get into the river and bathe right then (actually we were ordered to do so! ), so we soaped up the best we could with what was available--hand washing soap. Thank goodness we followed his instructions as the water quickly turned an ugly butterscotch color, the result of recent rains filling the tributary with silt when the Little Colorado merged with the main river. A few rapids followed, and a long stretch of flat water allowed us to look around and admire the changing rock formations. 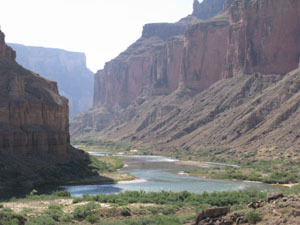 We made camp at Cardenas at mile 72, and Randy led a group up the canyon wall to overlook the river and Unkar Rapid, which we would tackle early the next morning. With a 16 foot drop Unkar provided us with plenty of splashes the next day. Again, views of the river far below and colorful rock strata of the canyon walls were simply amazing. drop we would experience the next day.